By 1860 Stephen Douglas had encountered criticism despite his great achievements in Congress. 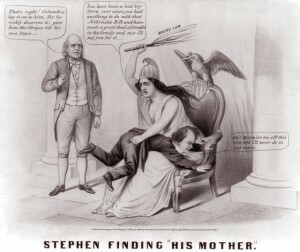 Maurer’s cartoon, though immediately drawing from Douglas’ “mother” story, connected with other issues. Douglas had begun alienating himself from Southern Democrats as an opponent to the extension of slavery. Critics also cited his close association with the Kansas-Nebraska Act, which determined the extension of slavery based on a state’s majority vote. Though the Act promised the success of this “popular sovereignty” within Kansas and Nebraska, it soon backfired and brought even more tension and violence to the states. Robert W. Johannsen wrote a leading biography entitled Stephen A. Douglas. The book, available for partial view on Google Books, provides closer analyses of Douglas through the campaign of 1860.